Someonepinchme to nil. Germany absolutely go through to the final. Without Thiago Silva the brazilian chaos collapses. We explain a mindblowing game. It was a game with few hints as to how the teams were going to act and as to how the game’s dynamics would develop. Especially the Brazilian team were a grab bag after Neymar and Thiago Silva were absent. Nevertheless, the German team were well on to to the few remaining constants. Most of all the team demonstrated their superiority when it comes to organization and serenity. All that resulted in this historic blow-out. Scolari remained faithful to his system and his way of playing and tried to compensate the absences on a one-to-one basis. Dante filled the central defender position next to David Luiz and Bernard replaced Neymar. The latter did play on the right wing for the time being while Hulk was the source of crosses on the left; after the 4:0 they switched places. Oscar occupied the 10 spot and showed up everywhere as a link-up player. With this formation the host was again looking for the very aggressive rhythm that had stood out during their last few matches. When pressing and counter-pressing they had a strong forward drive and looked to get into duels, on a man-to-man basis. When in possession the Selecao shifted play often and aggressively and played long balls, looking to break through with quick solo runs. Especially Marcelo frequently pushed high up the pitch. Gustavo then drifted left to cover and left the middle of the pitch to Fernandinho. The German team were able to nip ambitious build-up play in the bud, as they did against Portugal and France. The collective shifts designed to guide the ball when not in possession combined with the outstandingly adaptable advances of the eights could, again, not be broken. 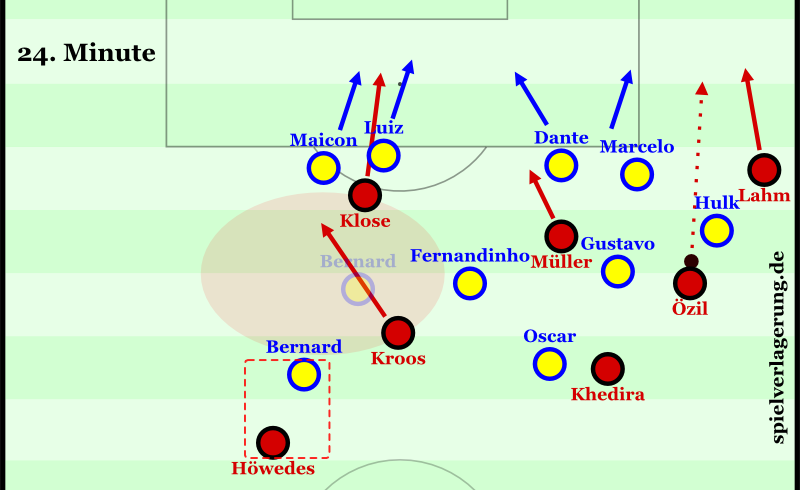 One of the reasons was, that it had been well adapted to the opposition yet again: Portugal and France had often been guided towards the left back by a narrower positioning by Müller. This time he stuck closer to his nominal equivalent Marcelo. The Brazilian’s play-maker in disguise was rarely able to get involved in the build-up as a result. Klose again looked towards the opposition’s right central defender – David Luiz – and guided play away from Özil. 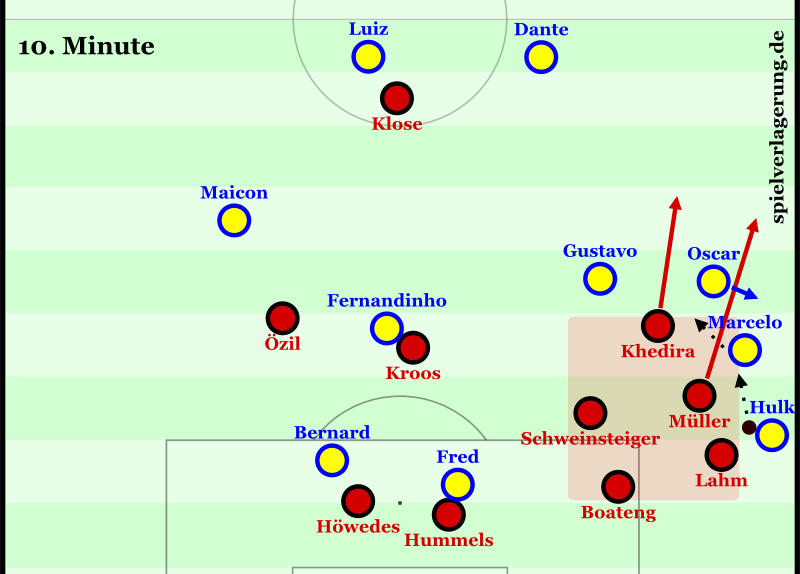 The large space between Müller and Klose was filled by the two eights: depending on the Brazilian scaling Kroos and Khedira advanced one after the other. Kroos was often the first to do so and was able to deny the strong Fernandinho access to the game. 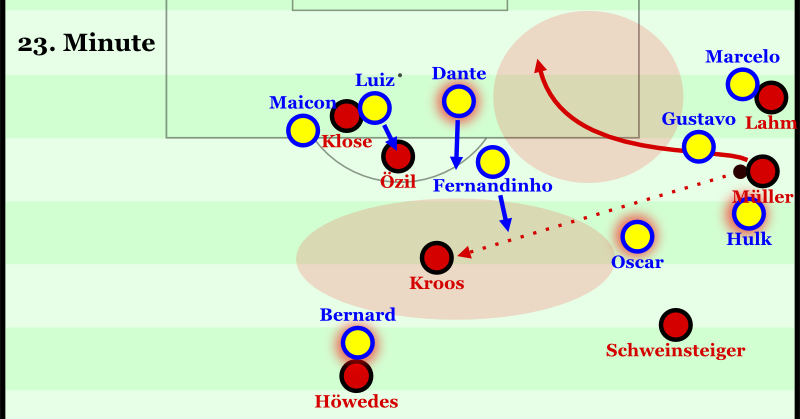 The subsequent pushing-on resulted in some unorthodox scenes, in which the right-side eight Kroos suddenly defended as a striker on the right (!). Frequently, aggressive 4-1-3-2 formations resulted when the second eight pushed up as well. The Brazilians with their rudimentary use of the middle couldn’t cope at all and had to kick the ball around. The exemplary reward for the surprisingly good advances was the 4:0. Before the 0:4: Right after kick-off Khedira and Kroos push up into Brazil’s build-up. Klose clings loosely to Luiz, Khedira guides Dante away from Gustavo, Kroos is able to aniticipate the only sensible pass to Fernandinho, gets the ball, bam, bam, goal. Despite the high back-line the Brazilians rarely threatened with long balls. Partly this was due to their distribution: The wingers played very wide, Gustavo was stuck in defense and so the large zone in the middle was only occupied by Fernandinho and Oscar. 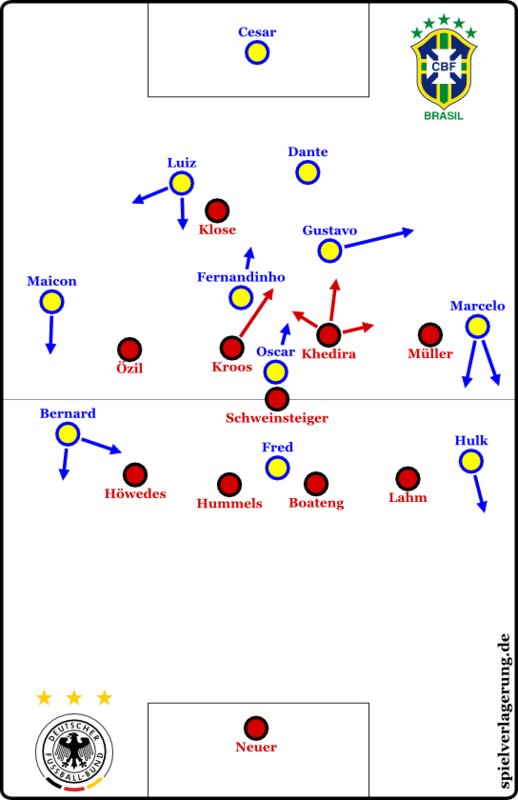 The Germans controlled this zone by virtue of superior numbers: when the eights advanced, the wingers drew back into a more compact position centered on Schweinsteiger. In addition, the central defenders pushed up when needed and were well covered. Due to the disciplined shifts towards the ball they won most second balls and were able to clearly isolate and outnumber the respective attacking player. There were three reasons why the Brazilian counter-pressing, up to now able to cover for the lost balls during aggressive attacking play in most situations, failed. 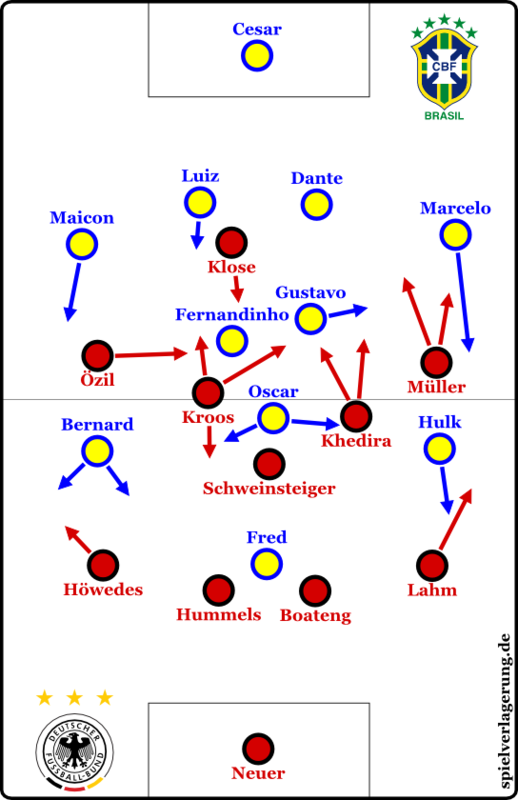 First, the German team shifted and guided their opponents better than most other opponents of the Selecao. As a result, they mostly outnumbered their opponents comfortably when winning the ball and were able to free themselves tactically as a group. Second, Germany played higher up the pitch and Brazil was rarely able to finish attacking moves or even get near the box. The ball was lost in midfield more frequently than usual and Brazil’s formation was not as controlled behind the ball either. Sometimes Gustavo was too busy to advance far enough. Thiago Silva was missing when it came to control the large space behind Gustavo. Third, the German team demonstrated all their tactical and technical aplomb. Almost all positions – especially those in central midfield – are occupied by very pressing-resistant players. After dispossessing the opposition the ball was frequently bounced back to Schweinsteiger for example. In his covering role he had a bit of space, found it reliably and distributed the ball towards more open zones. Lahm, Hummels, Kroos and Neuer contributed effectively, depending on the height of dispossessing, and Khedira had a special day as well. Before the 0:1: Even though Brazil opens play with a long diagonal ball, Germany get compact behind the ball quickly. Due to fialed coordination (Oscar runs away) Marcelo plays the ball to Khedira’s foot. He and Müller attack space immediately, Khedira passes Gustavo. As a result the German team was time and again able to break. The corner which lead to the 0:1 and the throw-in before the 0:2 were the result of breaks into the space behind Marcelo. Same picture in the second half, with the German team dropping deeper, Brazil only had sporadic control in counter-pressing and ran into dangerous breaks as with the 0:7. Oh my God, writing “as with the 7:0” about a World Cup semi-final you have to cover your mouth with your hand involuntarily. Oh Selecao, what have you done? Next to all the German dominance in midfield there was staggering penetration around the box, which, however, the German team can hardly be credited with. Coordination and discipline of the Brazilian defense lay somewhere between unstable improvisation and outrageous chaos. Man-based marking strongly watered down the collective shifts of the double six and the bank of four, so that large gaps repeatedly resulted (see image concering 0:2). Nobody felt responsible. Kroos, Khedira, Özil and Müller found the gaps again and again and caused panicked, unorganzied reactions by the Brazilian defense. Thiago Silva’s widespread control of space was sorely missed when it came to interrupting these scenes at the right moment or guiding play into save zones. Frequently the defenders were literally lost in the chaos. The way Luiz and Dante simply stand still at the edge of the box before the 0:2 is the best illustration. Before the 0:2: On first sight a reasonable situation for Brazil to get a grip, on second sight nothing is as it should be. Hulk does not attack Müller, but stalks him from behind without needing to (why??). Oscar has taken a mental break as well has just walked up a bit, opening the pass to Kroos. Because of the confused Brazilian shifting Kroos has reams of space (Bernard ill-advisedly man-based, see below). Fernandinho is one step to late to close the pass down, Müller runs into the channel between centrel defender and fullback. Dante pushed up towards the free Kroos. Instead of covering for him, Luiz man-marks Özil and stays there as Kroos plays the through-ball to Müller, who lets it bounce for Klose, even as the latter shoots and scores on his second try. Nobody here knows what he is supposed to do. Before the 0:5: Hummels has passed four opponents, but is still being followed by one and has Gustavo in front. Not yet a truly dangerous situation. Date has pushed up to confront Klose. But what is this? A curly head, lightning fast, breaks ranks to attack Hummels without any cover whatsoever. Maicon is thinking “Oh, offside trap!” and pushes up as well. But it is not an offside trap, Marcelo holds the line as usual. Brazil does not do offside traps. Luiz simply looses it here. A simple pass to Khedira and Germany breaks through. After the flood of goals between the 20th and 30th minute, discipline was gone anway. During the second half the German team were able to combine along the field from time to time. The gigantic hole between wing and middle from which Lahm set up the 0:6 was only one example for the numerous tactical errors. Before the 0:3: Even though Özil is on the right and Höwedes drifts narrow in defense, Bernard clings to his opponent up front instead of contributing to being compact. Fernandinho is draw out of position as a result and in the end Kroos uses this exact gap to score after Klose draws Maicon and Luiz into the box. Müller, too, finds a gap from which he is almost able to score. Meanwhile Hulk allows a cheap pass to Lahm who sets up the goal. All of this is covered for extremely well, even though Schweinsteiger as an additional player is not even in the picture. … and on the other side the defensively strong Bernard was not compact enough. Because he orientated himself towards the defensive Höwedes, his positioning was very high and wide. Özil’s space-grabbing pushes when attacking and the lack of width on the left were not punished – an opponent could simply push up very far without much risk because of this, silly then that he was not, because he clung to the fullback. Kroos also scored the 0:3 from the hole behind Bernard. Switching positions after the 0:4 was the right reaction for Bernard and Hulk. Bernard interpreted his role on the left more faithfully to his position and was much more alert. But, well: positional switch when 0:4 down… exactly. The incredible German efficiency has to be related to the peculiar psychological and tactical-psychological dynamics of this game as well. After conceding to a well-practiced corner kick early on the Brazilians tried to resist even more aggressively. They became more impatient, were individually more hectic in defense and so the chaos bloomed. Attacks were conducted in a flurry and they were not pushing up with less risk. Hard to imagine a goal like the 0:5 being scored in a normal game situation. Now they rarely acted reasonably when being outplayed. Instead of slowing down the tempo and delaying the game until their formation was compact again, they simply attacked the ball repeatedly. The two calm back-passes by the German team which lead to the 0:4 and 0:5 exploited this paniced reaction ruthlessly, so that single break-throughs became sure goals. Der calm, attentive rhythm of the Germans team was like an exactly matching key to unlock maximum potential in this phase as well. Of course luck when finishing and a flat performance by the goalkeeper piled on during the important goals two and three. The German team also demonstrated this calm self-perception in build-up from the start of the game. The were able to circulate the ball as cleanly as they are used to even against Brazilian pressing. Özil roamed in midfield more than he used to and Klose dropped back for short periods now and then, both factors leading to a loss of orientation for Gustavo and Fernandinho in their man-based behavior. In addition Germany controlled nearly every long ball when Brazil did advance far enough, because they had superior numbers in the middle and Neuer’s distribution of balls was strong as always. The move leading up to 0:3 was created this way. This tactical assuredness was very important in the period after the goals to keep the Brazilians from finding a way into the game. Reacting to the goals against, they made long runs and tried to create a lot of pressure, but against the German passing the pressure evaporated. The Selecao got frustrated, the reaction abated and Germany controlled the game until half-time. 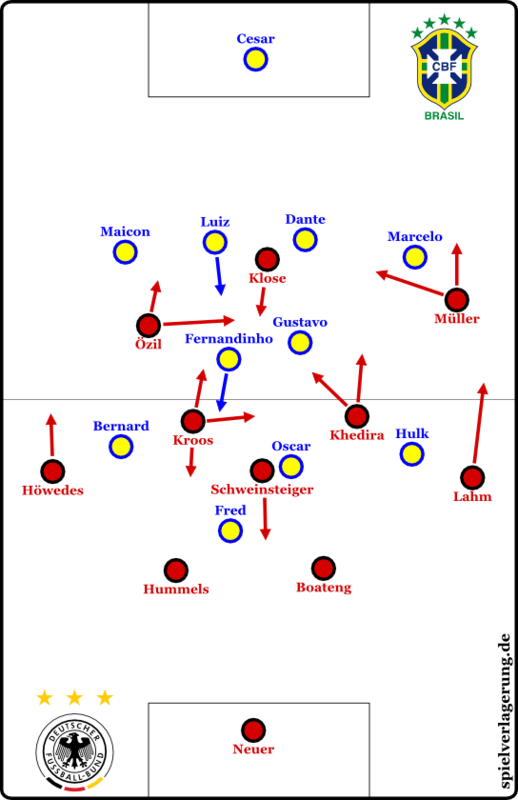 Following that the Brazilans demonstrated in impressive fashion how the game could have looked if the German pressing had been less consistent from the start. 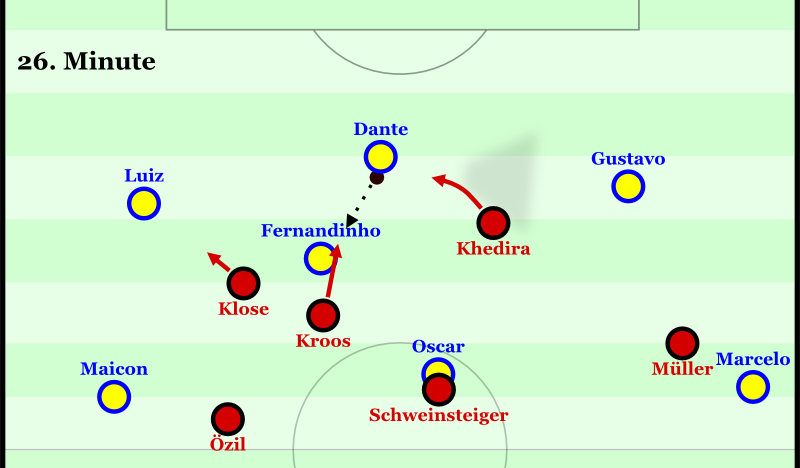 The Germans tried to preserve enegery with a deeper, more passive midfield pressing, while the Selecao pushed up even more aggressively and circulated the ball laterally with pressure. The guiding elements did not work anymore, but were being circumvented and broken in one-on-one situations after lateral shifts. Especially Marcelo managed to get in behind Müller (or Schürrle) and Bernard blossomed as well. Manuel Neuer and the excellent German defense in front of goal denied Brazil a way back into the game with one or two goals. Strangely enough, the possibility for this was there, so that the game could even have been full of suspense again. But Neuer kept the lid on and the powerful Brazilian rhythm increasingly slowed down. 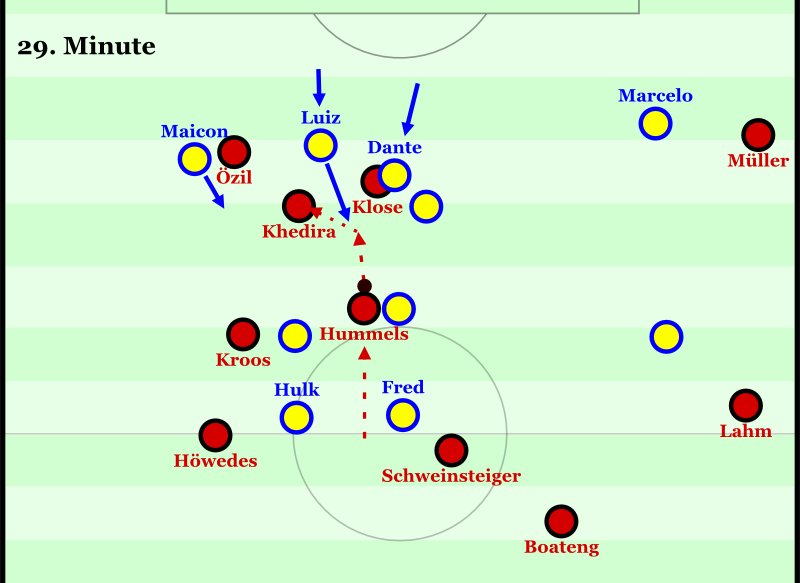 The German team contributed to this by investing more into their counter-attacks and staying consistently passive in pressing instead of letting themselves be outplayed by pushing up inconsistently. Towards the end Löw even switched formations. With Draxler to his left and Schürrle to his right Özil took over his customary number 10 position in a 4-2-3-1. The team was able to concentrate more on being compact within the banks of four and conducting counter-attacks this way. This resulted in the seventh goal via Schürrle artistry. The lack of pressure against the ball did allow the Brazilian consolation goal as well. Marcelo picked out Oscar with a spectacular long ball from his own half and underlined how important it had been to take him out of build-up during the first half. This historic game contained almost everything possible. Germany’s tactical adaption was outstanding, against the ball they were phenomenal, they broke with focus and had the necessary bit of luck in the decisive phase. Brazil could not replace its absentees, were badly prepared for an opponent, who would have given them a difficult game in the first place, and having to chase the game early under slightly unfortunate circumstances created a gigantic eddy of negativity. Curiously, the German attack was not even on strong form. The outstanding performance in midfield and the momentum of the game led to this kind of escalation. In the end the hosts were not experienced enough for the title. This is true for tactical aspects regarding the team and individuals (depth of squad, defensive midfield), it is true psychologically and it is especially true for group-tactical experience with and against the ball. The German team, on the other hand, made history. Especially minutes 23 to 29 could be the most important phase of a game in World Cup history. Now the task at hand is to write themselves into the history books on the first pages: by winning the cup. Original text by MR. Translation by FI.